David happens to be a very dear friend of ours. We’ve loved his house for years now. We’ve loved it for its amazingly glorious kitchen space. Oh my, what a sight. After a 5-year renovation David and his wife Elide possess one of the most functional kitchens I’ve ever had the pleasure of cooking in. He tells stories about a slop sink, sawdust and Thanksgiving dinner amidst laundry appliances. It all sounds so horrifying, it is hard to imagine it all being worth it, but it was. 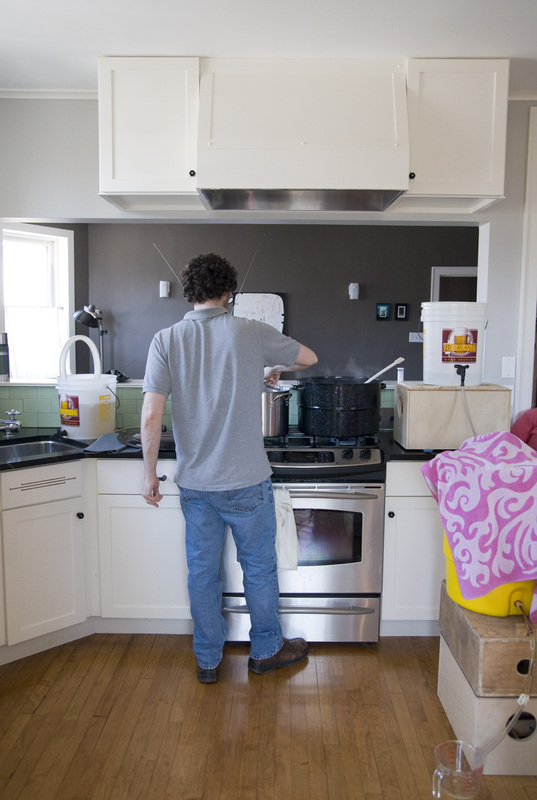 When we arrived, David had set up the equipment he would need to brew beer. He has fondly been brewing beer one small batch at a time for a few years now. He likes to refer to the operation as Nepenthe Brewing. Of course brewing beer requires all manner of fancy mysterious things. You can also start with an inexpensive beginners kit like this one. In general, Brew and Grow is an excellent resource. If you’ve never been, get ready for an adventure. 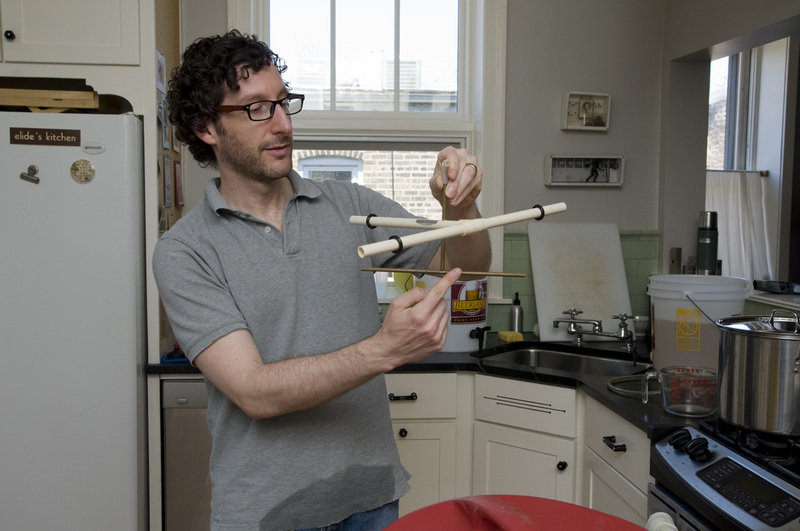 You can find some creative solutions for not having fancy tools online. I wouldn’t say David has all the fancy gadgets, but he sure does have a few. We began by sanitizing everything in sight. Super sanitizing it. Contaminates change the flavor of beer and ruin batches. So, David doesn’t take any chances. 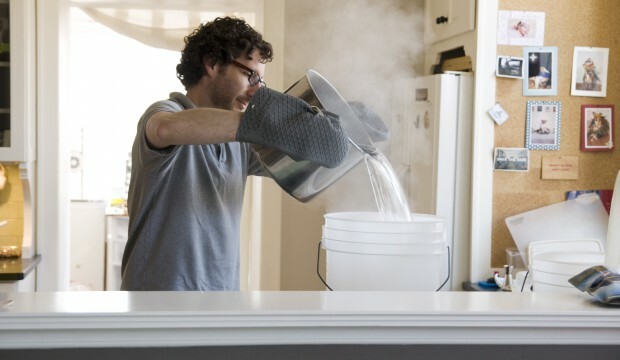 Once everything seemed sufficiently clean, David explained that there are really four main stages of beer brewing. Of course, every home brewer has their own process they swear by, and the following information is meant as a guide, not a bible. 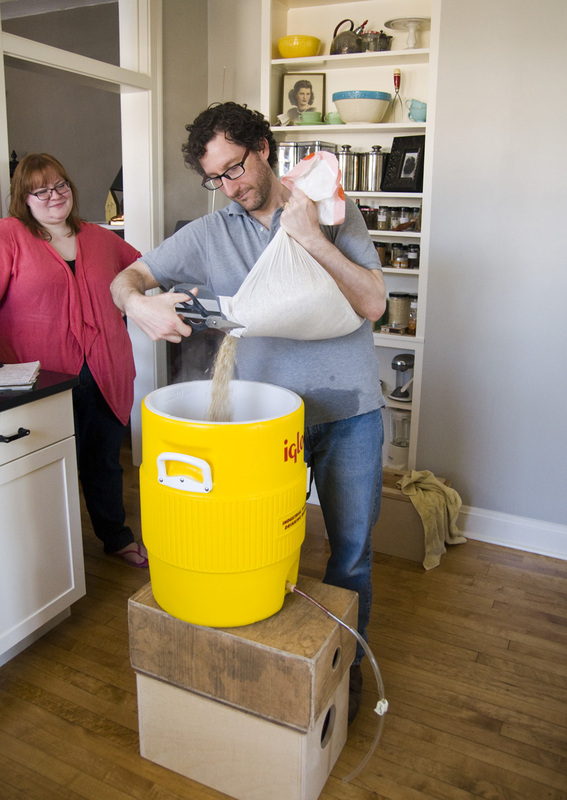 If you are brand new to brewing, you might want to begin with a beer kit before you branch out to copying this recipe. There are numerous varieties available. If you’re ready to jump in, read on! We begin with malted barley which is chock full of starches and enzymes. 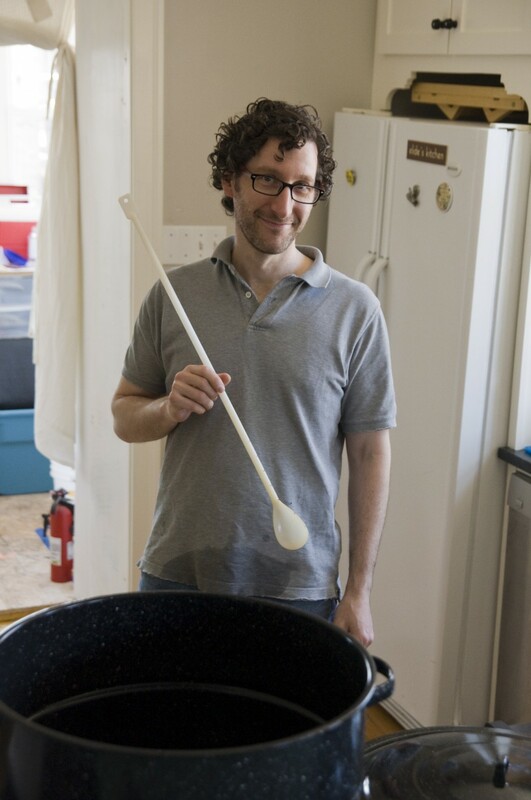 We add the malted barley grains to a bath of warm water, around 158 degrees Fahrenheit. This is called a mash. Right around this temperature, the enzymes are activated. They will attack and break down the starches in the barley to simpler sugars. The whole reason we are mashing is to get the sugar into the water. We want sugar, and so do you. This portion of the process should take around 45 minutes. Grain bed, which sits above the bottom of this container, letting the water flow freely through. 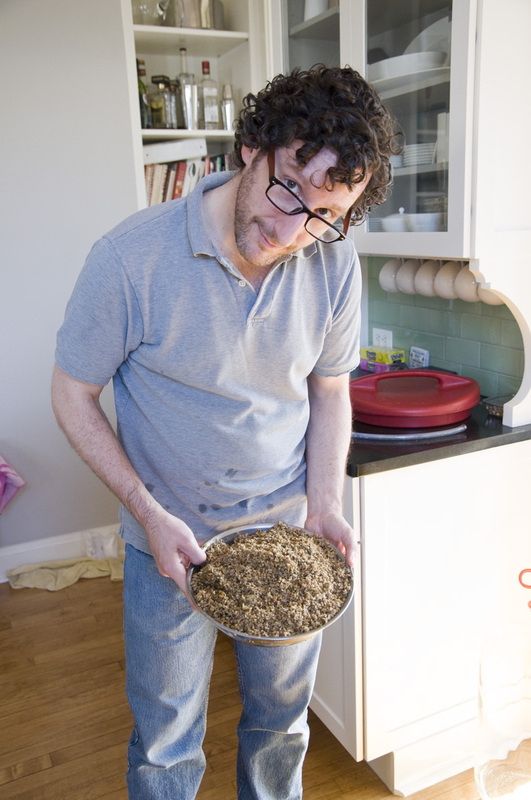 Lautering: Drain the grains through the grain bed. Be sure to reserve the water, which will become your beer. Now we want to increase the temperature of the liquid to make it too hot for the enzymes to care about their jobs anymore. It will also improve sugar extraction. You will run what looks like a sprinkler over the grains to further rinse them; you will also save this liquid, but discard the grains. Now you have wort. Congratulations! Your wort needs to be boiled for about 1 hour. Boiling the wort will improve the beer killing enzymes remaining from the mash, sanitizing and reducing the amount of liquid. That reduction increases the concentration of beer ‘flavor.’ The hops are also added here in this step. 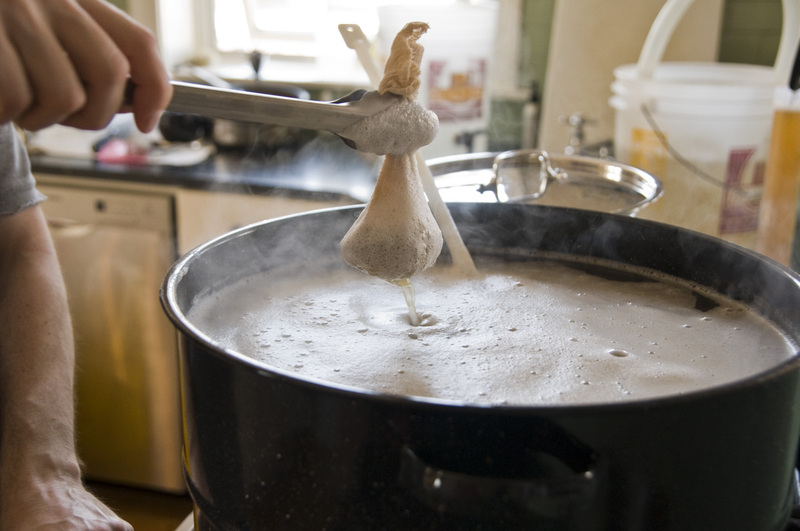 It really depends what kind of beer you are brewing, but hops added early during the boil contribute a bitter flavor to the beer which is valuable because they add a balance to sweetness. Hops at the end will transfer minimal bitterness to your final beer. 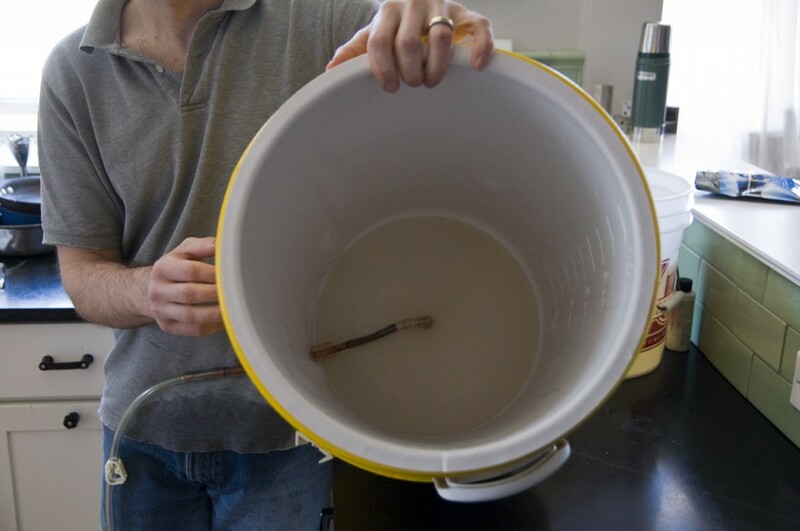 Reserve a bit of this liquid if you want to measure its specific gravity with a hydrometer. This will help you calculate an estimated alcohol percentage for your batch. 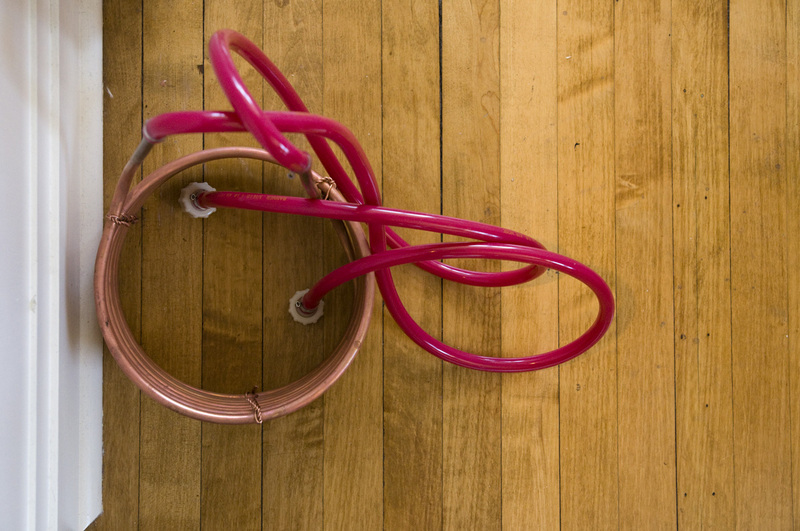 David has a Wort chiller, which is a pretty serious piece of copper tubing that you insert into the pot and run cold water through. The goal is to cool the wort down to about 68 degrees, which should take approximately 20 minutes. Again, this specification is for David’s American Summer Ale. Your times and temperatures will vary depending on the type of beer you’ve opted to try. 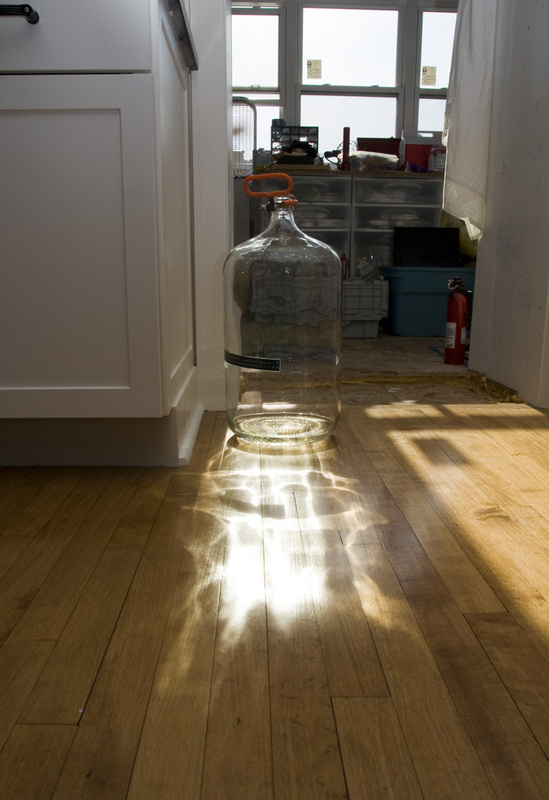 It’s a sunny day at the home brewery. Siphon the wort into the fermenter. Agitate. Or Shake the crap out of this. It’s heavy, so David rolls it on a padded floor. 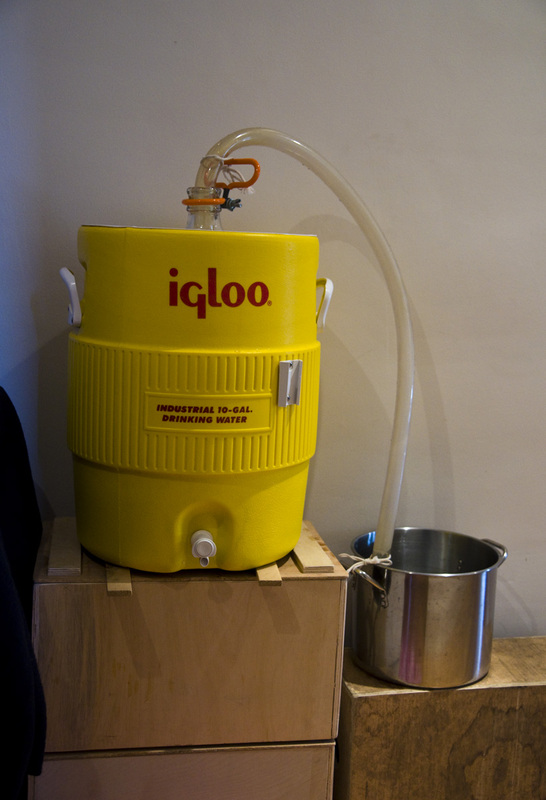 Make sure your 6 gal fermentation container is sterilized and ready. You could use a glass one like in these photos or a simpler food grade plastic bucket with a spigot sold at any brewery supply store. 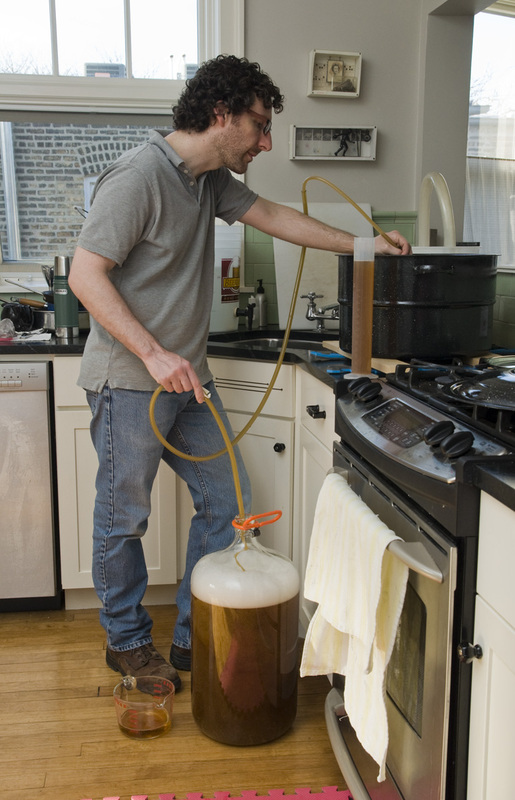 Transfer your cooled wort. The yeast David prefers comes in a packet you need to pop to use. 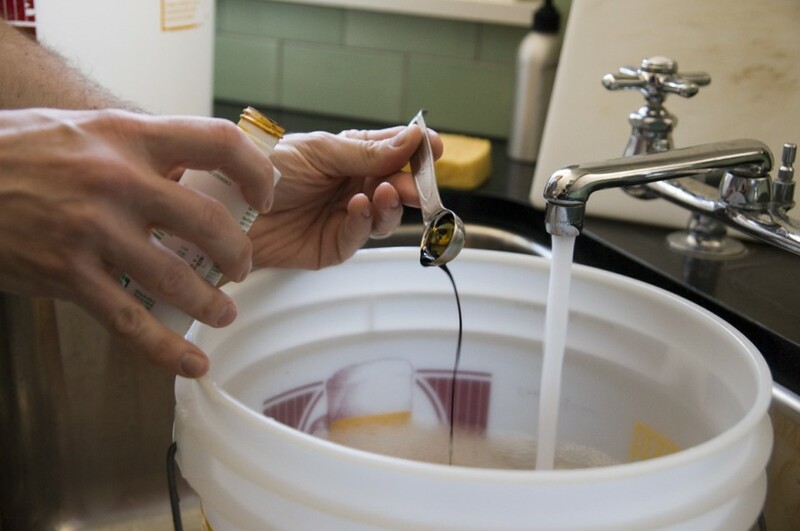 Give the bag a solid bang, and add it to the wort in the fermenter. This yeast is alive, and it will feed on sugar. The two byproducts of the the yeast are alcohol and carbon dioxide. At the top of the fermentation tank is an airlock that both allows the CO2 to escape and prevents foreign material from entering. Anything that gets in the beer will contaminate it. You should notice some activity within about 12 hours. 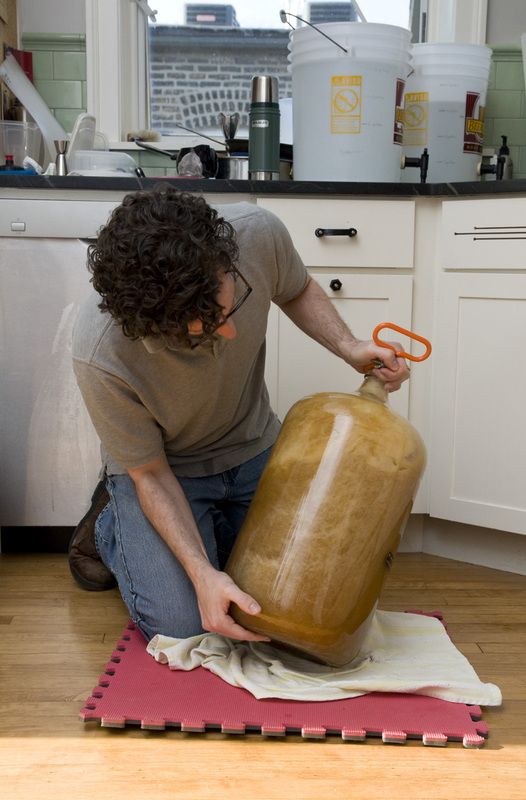 David likes to use a secondary fermentation after about 11 days. He then lets it ferment for a further 21 days in the second fermenter before bottling. For fermentation, the glass fermenter is set inside this cooler to help maintain temperature and keep light away. 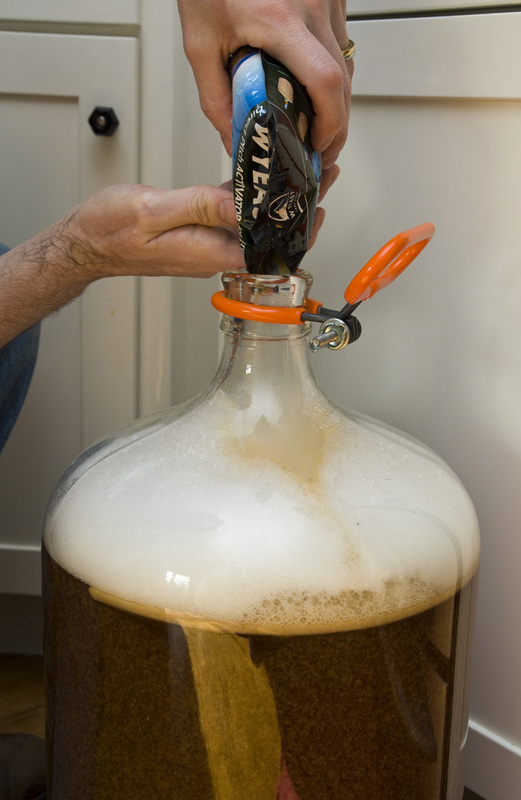 David opts for a blow off tube before switching to an airlock. Check out brewery.org’s Beginner’s Guide to Advanced & All Grain Brewing for even more information. Check back for How to make beer Part II: Bottling, coming soon!